Judaism has powerful teachings about the proper treatment of animals. The loss of a beloved pet can often be a heartbreaking event for any family. It’s as if a loving, loyal member of your family who has been part of the very fabric of your lives has suddenly been taken from your midst. Our pets are there for us through thick and thin, providing love, laughter, smiles and comfort through so many moments of our lives. Anyone who has ever loved a pet knows how devastating its death can be. Anyone who has ever been loved by a pet understands that this love will always be a part of you. Ordering a Pet Memorial Plaque perpetuates the memory of your beloved animal. 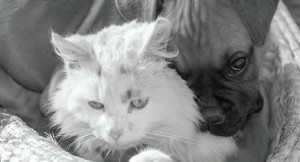 It serves as a recognition and ever-present reminder of how your pet has touched your life in a profoundly special way. Honor your family’s treasured pet with a hand-made, personal ceramic tile, which will be prominently displayed on KI’s Pet Memorial Wall; an outdoor art wall where we will pay tribute to our beloved pets. The cost of a Pet Memorial Plaque is $250. Each year, during the weekend when we read the story of Noah in the Torah, we will hold a symbolic memorial service remembering all of our beloved animals. For further information about a Pet Memorial Plaque, please contact at Masha Fleissig, Membership Assistant, at mfleissig@ourki.org or 310.459.2328.